Born a slave in a land under the shadow of devils, Lem was blessed with a quick wit that earned him easier work as an entertainer. He escaped from slavery, and looks for things to laugh about so he can forget the misery his fellow halflings endure back home. During Combat Lem knows he is best in a supporting role, and tries to stay out of melee if possible. 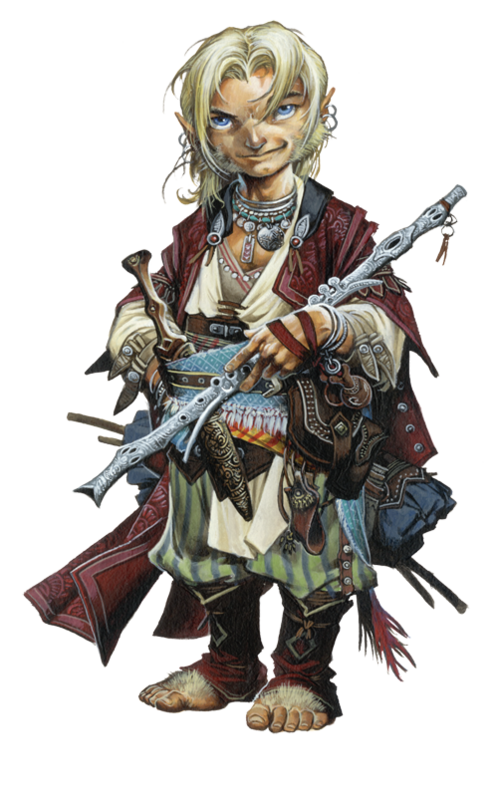 Instead, he uses his bardic performance ability to inspire courage in his companions, alternating between giving support and using well-placed spells to charm or otherwise waylay foes. Although Lem was raised in a wealthy household, his childhood was anything but comfortable. Born into slavery, he was sold a half-dozen times before he reached the age of 2. Always quick to side with the underdog, Lem has learned that his most powerful traits are his optimism and his sense of humor.